Ultra high-performance tire for specialty and Original Equipment applications. "- Steering Responsiveness - Solid center line and large shoulder elements help deliver responsive steering and confident cornering. - Ultra Wet Traction - TredLock technology — microgrooves help provide biting edges for commanding wet traction and grip in turns. Dry handling zone puts more rubber on the road for superb dry traction and handling. 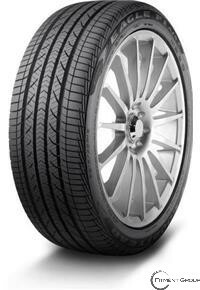 Dual-zone, asymmetric tread pattern helps shed water and slush for enhanced wet grip and all-season performance.